Conceptual Options Surrogacy News: Viva La France! Surrogate Children are Granted Legal Recognition Finally! According to news reports out of France from last week, it appears that France has finally changed their tune regarding surrogacy births overseas. There have been many of our own clients over the years who have had to live in fear regarding the legal recognition of their children, but not any longer. Congrats to all of the parents in France who have been dealing with this issue for so long – Viva La France!! Read more here about France legally recognizing children born via surrogacy. At the end of last month, Conceptual Options was honored to show our gratitude while spending quality time with our community of surrogates. 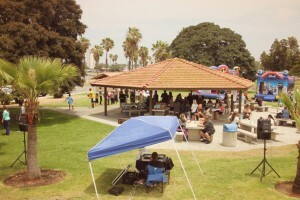 This summer’s party was attended by all and was a huge success (see party photo below). Children, spouses and significant others also attended, and there were gifts and prizes for everyone. Feel free to come join us for our monthly support group meetings and our Summer and Holiday Parties that are thrown twice a year for the spectacular women and their families who mean so much to all of us here at Conceptual Options. Join our community of surrogates that understand that they are a community of empowered women making the world a better place for families, including their own families. Thank you!!! Conceptual Options is a Premier Southern California Surrogacy Agency that is focused on the whole person experience for both the Intended Parents and their Surrogates.